We’re not talking about dreams of the boogie man, your family abandoning you, falling, or being chased by the bad guy. Or, are we? In some cases, this type of nightmare is exactly what we’re talking about. Read on to find out why. This article presents four nightmares that title insurance can prevent for Saint George home buyers. Suppose you bought a house, painted it, moved in, fixed its broken whatevers, landscaped the yard, and started raising a family. You’re a proud St. George home buyer. After a few years, you get a call from the County Assessor’s office, telling you that the person who sold you the house did not have the right to sell it on that property because he did not have a proper deed/ownership. The grandson of Joe homesteader, from 60 years ago, is now claiming ownership of the property that the house is sitting on. Now, the fun begins! First, you try to talk to the grandson, but that goes nowhere. Next, you talk to a lawyer, but any advice from the lawyer is bad because it is either “You have to move,” or “You can fight it in court.” Both are nightmares, and both cost money. As a Saint George home buyer, you may be one of the many who are buying new construction. St. George is considered among the fastest growing cities in the USA, and there is plenty of land and lots being developed for new construction. Suppose the house gets completed, and you are given approval from the inspectors to occupy it. After a few weeks, you get a letter from the plumber who claims partial ownership of the property because the general contractor failed to pay the plumber for his work on the house. You call the contractor, and he has filed bankruptcy. So, you either pay the plumber to release the lien on the house or get a lawyer involved. Just what you always wanted! 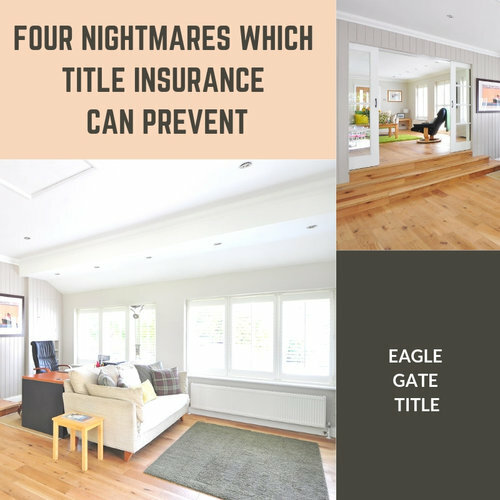 The third nightmare happens occasionally to St. George home buyers when they build or place something at the back of their property to enhance quality of life, such as a basketball court, chicken coop, shed, or swimming pool. Suppose you built a mansion for your chickens. A few weeks go by while you’re humming and whistling to the cackling of the hens, and enjoying your new facility. Then your fun comes to a screeching halt with a hard knock, knock, knock at your front door, The man in a hard hat says, “There’s supposed to be an easement at the back of your property, Mr. Coop, so utility vehicles can access electricity and phone lines.” What? Yep, it’s a pre-existing easement (space) which you didn’t know about because you did not buy the right title insurance. Finally, we get to the literal nightmares. If you fail to get a good records search on your property, as a St. George home buyer, you may find out later that the lot upon which your house stands was many years ago used for dumping toxic waste, or even better, was a cemetery. Now, you have something to dream about: poison chemicals passing from the soil of the garden into your vegetables, or zombies reaching up through the ground, climbing out, and stomping around your yard. If you’re lucky, the zombies will mow the lawn and feed your chickens.